The Alm Butler simply ensures you get that little bit more relaxati. The Alm Butler is always ready to help and provides his guests with excellent service. On guided Alm Butler hikes, he pays special atten- tion to his guests‘ wellbeing with little surprises and insider tips. The Alm Butler stations serve as an additional service and invite guests to enjoy the natural surroundings at secluded resting spots. 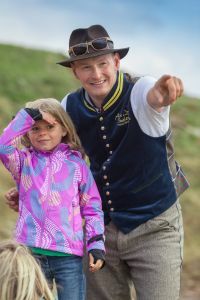 Dressed in his stylish alpine outfit, the Turracher Höhe Alm Butler guides visitors to the most beautiful locations around Turracher Höhe, organises sunrise tours, picnics on the banks of one of the wildly romantic lakes or an unforgettable breakfast on a mountain peak. For the summer of 2016, our Alm Butler has once again compiled a multifaceted programme – also for younger visitors to Turracher Höhe. Anyone holding the Alm Butler Card can use the exclusive Alm Butler service free of charge during their entire stay.